Michael Tabor and the Licking Creek Bend Farm, for 45 continuous years, has been bringing sustainably grown and affordable produce to the ADAMS MORGAN, NIST, WARD 8 and BROOKLAND FARMERS' MARKETS. PLEASE VISIT OUR FARM ON SUNDAY, JUNE 2, TO MEET OUR AMAZING STAFF AND SEE WHERE YOUR VEGETABLES AND FRUITS ARE GROWN. SHARE A POT LUCK VEGGIE DISH, TOUR THE FARM, SWIM IN THE CREEK, PLANT AND HARVEST, AND GENERALLY ENJOY A RELAXING DAY IN THE COUNTRY. Owner and social activist, Michael Tabor, started the farm in 1972 as a diaspora kibbutz. After the city folk retreated back to the city, Michael started farming in earnest and going to farm markets in 1974. 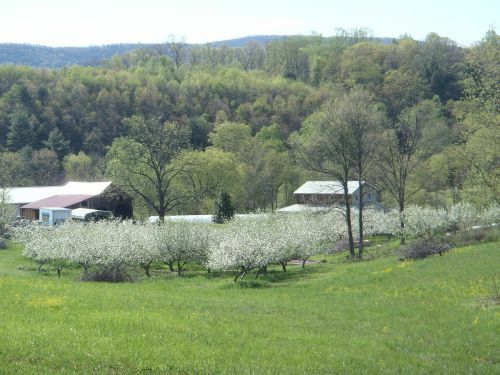 Licking Creek Bend Farm consists of 60 acres, of which 5 - 10 are farmed each year. He practices a rotation of fields each year. The farm is a Certified Naturally Grown farm with six full-time employees. Our philosophy is that a sustainable food system starts with local farmers, who know their customers. We maintain a 120-member community-supported agriculture, (CSA) program, that accepts WIC holding families. Our produce is sold to two Washington DC area food co-ops, at five farmers' markets and to two local universities through Bon Appetit Food Services. We sell direct to consumers in underserved communities, with our largest market on Saturday mornings in the Adams Morgan neighborhood of Washington DC, where a substantial percent of our business comes from WIC and SENIOR farmers market programs. In addition to the wide variety of fruits and vegetables we grow, we also grow and sell sustainably maintained Christmas trees that are cut to order. If you are planning to give a tree as a gift to a teacher, a limited-income family, or community worker, you can have them contact us to come and pick one out in your price-range. We discount gift trees. If you know of a family who can’t afford a tree, or a shelter, we’ll have a limited number of trees we can donate anonymously. HOW TO ORDER: Please pay by check. Please email your order to esiegel2@igc.org WHICH MUST INCLUDE: 1. your name, 2. email, 3. phone, 4. type of tree, 5. Height (please not a range! ), 6. pick up location, 7. when you want to pick up, 8. wreath order, 9. Garland (#ft) order, 10. Holly (how much), 11. Boughs (how much) ASAP. Takoma Park weekly pickups Thursdays until Christmas. Pickups by appointment - call 301 587-1739. Adams Morgan Farmers Market, Saturdays (8:00am – 1:00pm) through December 24th. Mark your pick up date on your calendar. Bring bungee cord and rope. If you’d like to pick out your tree at the farm, Michael likes the company and it’s a fun adventure. "Thank you so much-- we have really enjoyed the CSA, and are very much looking forward to next year. I would also like to add that the crew that comes to NIH are wonderful ambassadors for the farm. You have great people."